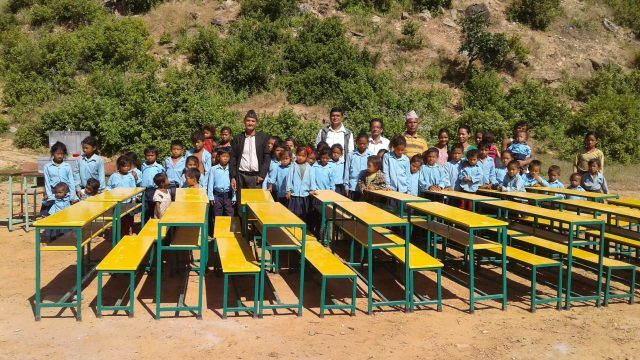 In addition to the earlier supply of uniforms, Bags, stationeries, shoes, socks, carpet and ECD kits, NJSI has given furniture for the students and staff at Shree Sundevi-Sunkoshi Primary School in Ramechhap on Oct. 27, 2016. Mr. Ramhari Thapa Magar, Field Staff of NJSI, handed over the school furniture and education materials to Mr. Shambu Majhi President of School Management Committee, in the presence of School Management Committee and school Authorities. The School is located in the remote village (Ward No. 1 Lubhuchhapadi) Rakathum in Ramechhap District which is about 80 kilometers away from Kathmandu. After the April 2015 Earthquake, the two school (Sun Devi Primary School and Sun Koshi Primary School) had their buildings collapsed. Now both the schools have been merged into one and accommodates 65 students from Chapadi and Lubhu Village.